16 | February | 2012 | Beyond The Yew : Saying NO to Zionism! On a visit to Cyprus, Israeli Prime Minister says Iran is ‘most irresponsible’ country in the world. Israeli Prime Minister Benjamin Netanyahu said Thursday that sanctions against Iran had not yet worked, adding that Tehran’s nuclear pursuits made it the most “irresponsible” country in the world. “Iran is the most irresponsible country in the world and it is breaking all the rules,” Netanyahu said during a one-day visit to Cyprus. “The United States – and any other country – should be concerned because we have information of ongoing efforts and attempts by Iran to conduct terrorism in many parts of the world. Fortunately until now there has been no loss of life,” he said after talks with Cypriot President Demetris Christofias. His remarks came a day after Iranian President Mahmoud Ahmadinejad inaugurated three new nuclear projects, in a show of defiance of international pressure for the country to abandon its program. In Bangkok meanwhile, police said three Iranians linked to a series of blasts in the city had come to Thailand to target Israeli diplomats. Authorities are investigating possible connections with recent attacks on Israeli diplomats in Georgia and India. Earlier Thursday, Israeli Defense Minister Ehud Barak said Iran was exaggerating the progress it had made in its nuclear program, in order to make the world believe it was too late to stop it. “Yesterday’s show was really just a show, both for the Iranians themselves, to strengthen their spirits, and for the entire world,” Barak told Israel Radio. “They are boasting achievements that aren’t there yet. They are talking about a third and fourth generation of centrifuges. I think they still have a lot to do with the second generation, let alone with the third,” he said. The world could not afford to ignore the considerable progress Iran had made and must intensify sanctions against Tehran, the minister said, stressing however that Iran had not yet reached the point of no return. “They are presenting a situation that is better and more advanced than they really are in, in order to create a feeling with all players that in fact the point of no return is already behind them, which is not the case,” he said. 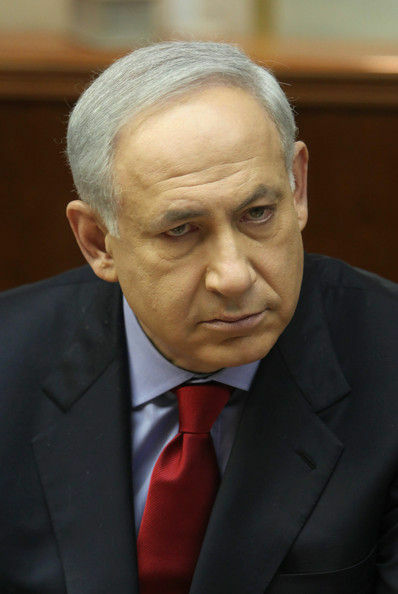 Israel has been a leading voice in an international campaign to halt Tehran’s nuclear program. Like the West, Israel accuses Iran of pursuing nuclear weapons. Tehran denies the charge. But perhaps more interesting than the center itself is the reaction to the horse manure that it was trying to sell in the Journal. It is worth looking at the comments on the op-ed, which are generally hostile to the idea of a new war on behalf of Israel. It is refreshing to think that maybe Americans, even readers of The Wall Street Journal, are actually wising up to the con job they have been subjected to, even if it is a bit late to do anything about it. The BPC claims to be bipartisan because it includes both Democrats and Republicans, but that does not mean that it is objective. More than three years ago it produced a “task force” report on the Iranian threat called “Meeting the Challenge: U.S. Policy Toward Iranian Nuclear Development.”It concluded that Iran has no right to enrich nuclear fuel for any purpose and predicted that Tehran would have sufficient highly enriched uranium in a year’s time to build a bomb. It advocated talking to Tehran to give it a chance to surrender on all key issues before attacking it, and it urged newly elected but not yet inaugurated President Barack Obama to build up forces for the assault. The task force recommended that the U.S. military should, after bombing Iran into submission, remain in the area, vigilant and ready to react to any attempt at retaliation by Tehran. Now, long after the alarming report, Iran still has neither a nuclear device nor any weapons-grade fuel, and there is no actual evidence that it has a program to produce a bomb, meaning that a war would have been another case of “preemption”of nonexistent weapons of mass destruction, reminiscent of the deceptions that led to the invasion of Iraq. And call for a U.S. attack could hardly have been otherwise based on the makeup of the Bipartisan Policy Center task force that produced it. It included Dennis Ross, who has been described as the State Department’s“lawyer for Israel”; Steve Rademaker, husband of Danielle Pletka of the American Enterprise Institute (AEI); Michael Rubin of AEI; Kenneth Weinstein of the Hudson Institute; and Kenneth Katzmann of the Congressional Research Service. Rubin drafted the report with project director Michael Makovsky, brother of David Makovsky, the senior fellow at the Washington Institute for Near East Policy, a pro-Israel think tank that was founded by the American Israel Public Affairs Committee. No one on the task force was an independent expert on Iran who might have been willing or able to express Iran’s concerns or point of view. Indeed, apart from Rubin, no one on the task force knew anything about Iran at all, except possibly that it was supposed to be part of the axis of evil. The BPC followed up on its brilliant analysis of developments in Iran with another blockbuster a year later. Its National Security Project’s September 2010 report, “Assessing the Terrorist Threat,” concluded that there is a growing danger to the United States derived from the radicalization of some American Muslims, a number of whom allegedly had joined extremist groups abroad. The report and its conclusions received wide distribution in the United States mainstream media, including The Washington Post, National Public Radio, and the Associated Press. But the alarm appears to have been sounded a bit too early and too stridently. Since 2010, there has been a notable lack of homegrown terrorist plots. In fact, The Christian Science Monitor reported two weeks ago that “homegrown terrorists have become less numerous, less organized, and less lethal in the past few years.” There were only 20 domestic terror cases leading to arrests in all of 2011, and of the 14,000 murders in the United States that year, none were terrorism-related. The current effort by the BPC team on Iran is derived from a much longer piece called “Meeting the Challenge: Stopping the Clock,” which the Center describes as its “fourth report on the most immediate national security challenge facing our nation: Iran’s continued progress toward nuclear-weapons capability.”Robb and his stalwart cohorts seem unaware that there are at least 50 countries that have “nuclear-weapons capability,” including Saudi Arabia, Egypt, Brazil, Argentina, and Turkey. They also appear to be uninterested in explaining exactly why Iran poses more of an immediate national security challenge than already nuclear armed North Korea or the deteriorating relationships with China and Russia. The 13 “experts” convened to deliberate over the report included Robb, Rademaker, Eric Edelman (who replaced Doug Feith at the Pentagon), and Mortimer Zuckerman. There is not a single actual expert on Iran among the names. It should be presumed that well-known neocon Michael Makovsky actually wrote the report. The BPC has plush offices on Eye Street in Washington, a sizable staff, and a number of important people on its masthead. It might be churlish to ask where its money comes from, but I would hate to embarrass someone as self-important as former senator and governor Charles Robb. The fact is that groups like BPC do a major disservice to the people of the United States because they promote themselves as nonpartisan and free of any particular political agenda when they are anything but. Their claimed objectivity is clearly a fiction, as they have been calling for military action against Iran for years, citing nonexistent threats and even speculating on the state of a nuclear program that does not exist. Their failure to include anyone who actually knows anything about Iran on their team and their choice to exclude anyone who might oppose a new war or be disinclined to think that all Muslims are potential traitors should tell us everything we need to know. It is a sad commentary on the state of the United States that ignorant, blowhard warmongers such as the BPC receive money, political support, and press coverage while groups that want to restore sanity and balance to American foreign policy are forced to scramble to raise nickels and dimes. Is Iranian Government Behind Recent String Of Bombings? Not Bloody Likely! Iran seems an unlikely culprit for the series of attacks that have occurred in South Asia and the Caucus region of Eurasia, according to Ashrin Adib-Moghaddam of the Guardian. Of course this would be a non-story if the “foreigners” had been of any other persuasion, but since the Thai government claims to have found Iranian passports on two of the three suspects, the Israelis have jumped on the story to exploit it as an act of terrorism. Glaser continues by pointing out that, “The attacks came just days after NBC News broke a story in which an unnamed U.S. official revealed that Israel funded, trained, and armed the Iranian terrorist dissident group Mujahedeen e-Khalq (MEK) in carrying out assassinations of Iranian nuclear scientists. Comments Off on Is Iranian Government Behind Recent String Of Bombings? Not Bloody Likely!